Well, “the fix is in” as the popular saying goes. As previously reported here on Urban Indy, and in what caused a huge stink, a utility pole planted directly in the middle of a new sidewalk seemed like a huge missed opportunity to improve a stretch of Shelby Street that is currently being subjected to the construction of Indianapolis’ first on street cycle track. A reader had sent along photos of the offending utility pole which I was able to get weigh in from Indy DPW that they were going to “fix” this. 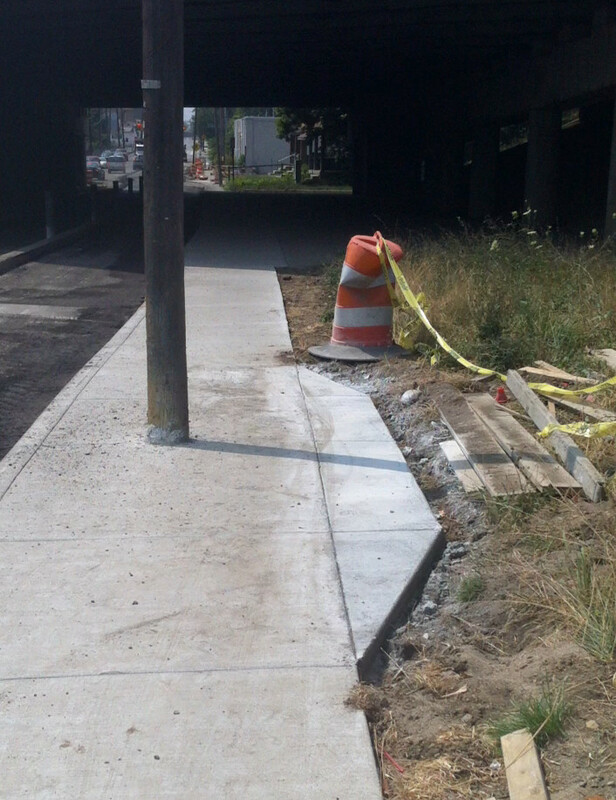 Well, as you can see they have “fixed” the issue for pedestrians who may be disabled or who may be using a wheelchair. Technically, this will allow people to move around the utility pole but I would be lying if I said that I took pride in the manner with which the contractor has fixed it. Did DPW order it to be fixed this way? Did the contractor assume that this method would be enough to satisfy the complaint? Whatever the case, this stretch of road that will have a nice cycle track will be bruised with what amounts to an embarrassing example of design, planning & construction. 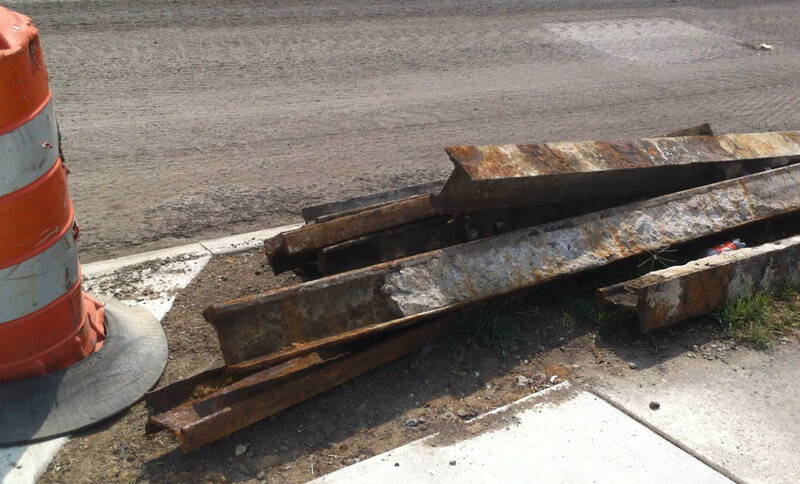 As a parting shot, the reader also sent me a picture of a pile of old streetcar tracks that I assume were removed and lay in a pile now. I commented in my email to DPW that it is sad we are not actively planning, at least not that I have seen publicly, to reintroduce streetcars to Indianapolis’ streets. Oh God. Really? I mean, really?! Sorry to follow up on my own post, but i’m really infuriated by this. Tempted to go out there with a saw and just chop down the d%$@ post. That is sad. I’m sure they went with the cheapest solution possible. What can we do to change this mentality in the city? What pains me about this is that our city has decided to build this wonderful cycle track project to demonstrate how well it works. This jog around will be visible along the new path and if I were giving a representative from another city a tour and showed them this project, I sure wouldn’t be proud to point out the cheap work around in place of doing the right thing. It is known where these poles are ahead of time…. why aren’t they planned to be moved when the project goes to bid? We can do so much better. So sad. I bet they splurged on a bag of instant concrete and hired a kid to put the water on it. It is terrrible that a city which doesn’t hesitate to toss millions into the pockets of certain connected people can’t find a thousand bucks (if that) to have one light pole repositioned. There is another light directly on the opposite side of the street, so this one isn’t exactly necessary anyhow. They could just remove it!. In automobile racing things like this are called chicanes. They are artificial obstructions designed to slow competitors down. What a wonderful example of an artificial obstruction. Perhaps the Indianapolis Motor Speedway was consulted. Let’s talk about who’s the head of DPW. Maybe a start on these problems? Too bad this city can’t move forward with certain things. Did they already have the right of way to do that little runaround? If so, they should have put the light there instead. But I’m concerned they put that outside what they own. INDOT’s going to argue with DPW over ownership? That would be awfully petty. Did anyone contact the City Councilperson with this photo? Seems like something worth bringing to that individual’s attention if it is going to get raised as a DPW/city policy. It is simply a joke to these people. If it weren’t for us, this wouldn’t even be passable. Now it does the minimum it could do. I guess when someone thanks DPW for this and they say “it was the least we could do” it is actually the truth. This city has no committment to a long term vision of a truly integrated pedestrian network or complete streets. I was somewhat pleased that the Parking meter lease DT would move to single pay boxes and I assumed it would remove the horribly intrusive meters along the sidewalks…..NOPE. They just converted them to numbered poles that are even harder to see. I had always believed when I was younger that Indiana was bad, but at least Indianapolis was different. I took pride in saying I was from Indianapolis, carefully leaving out Indiana, but it appears even city politics favor a suburban flare over the core urban setting. Maybe one day it will truly be too expensive or we will honestly be broke and have to change, until then I’m afraid, we will face many more examples like this. One step forward, three steps back. I can’t quite figure what is going on with the meters. On Alabama Street between Market and Ohio, there is a pay box, but in addition, the old meters have been converted to the new interface. On Ohio Street a couple of weeks ago, near the Statehouse, the meters have been removed and replaced with the arrow signs, but the single pay box was non-functional. I am glad to see people of this city concerned about the conditions for pedestrian access. However, it is just as disappointing to see how ill-informed you can be. It is not just as simple as moving 1 pole. Since the picture was taken with little indication of location I can only assume it is the light pole north of I-65 on the west side of Shelby. In this case, the pole might be able to be moved, BUT you are talking about possible purchase of right-of-way, a minor shutdown of traffic in order to run new wires across from the east side, and a crew to do the work. Crews that are no doubt working on the Cultural Trail and other various projects around town. The fix was what was possible given the restraints of the system. Even then, that new section of sidewalk may not be on the city’s right-of-way. A recent project in Avon required a turn lane addition through existing power poles. These poles were left in the ground for the first coat of asphalt while the different utilities created a schedule to relocate them. The project did not close all of the road and was done very quickly. The issue isn’t the work that goes into the project, the issue is the single focus on cars at any expense to pedestrians. This should have never ben in this situation to begin with. They created the problem and they can fix it! Aidan, a quick look at Google Streetview shows that the sidewalk probably could’ve been built with a 5-foot or so setback from the curb, just as it is to the north of here without getting into the embankment for the I-65 overpass. Regardless of whether the City currently controls that specific right-of-way or whether they would have needed to contact someone at INDOT, the larger point is that they virtually never take these issues seriously and they don’t look for creative solutions. Light pole or not, narrow sidewalks, directly adjacent to the curb, without on-street parking are never appropriate, so setting the sidewalk back would have addressed two pedestrian issues at once. Just take a walk down 16th Street anywhere near college or on the north side of 10th east of Dorman and it is obvious that the city has not considered pedestrians or the disabled for a long, long time. Poles punctuate the crumbling sidewalk and leave no room for a wheelchair and barely enough room for a stroller. I would think that ADA rules would require relocation of the poles (or moving the power lines, phone lines underground) whenever the sidewalks are replaced. I have some exciting news about this, but will temper that until something really happens. This isn’t over yet. Is that new concrete within the city owned right of way or is it encroaching on private property. If it encroaches on private property that opens up a lot of legal liability issues.